The U.S. Air Force's robotic X-37B space plane has quietly passed the five-month mark on its latest secret mission in Earth orbit. The unmanned X-37B spacecraft launched into space atop an Atlas 5 rocket from Florida’s Cape Canaveral Air Force Station on Dec. 11, 2012, kicking off a mission whose objectives and payloads are classified. What OTV-3 is up to on its confidential cruise remains unknown. However, a network of vigilant skywatchers is monitoring the mission as it progresses. "It’s certainly important not to forget about these programs," said Ted Molczan of Toronto, a leader in the worldwide community of satellite trackers. "Careful observation over a long time may provide the clues to finally solve the mystery." Molczan said that, even then, he suspects that any breakthrough in knowledge regarding X-37B’s orbital missions will more likely result from leaks by insiders to journalists. Recent image of the U.S. Air Force's X-37B robotic space plane, which launched on its third mission in December 2012. Photo taken by satellite spotter Greg Roberts of Cape Town, South Africa. Satellite watchers did note that in early March, OTV-3 propelled itself upward 29 miles (46 kilometers) to raise its orbit to 248 miles (399 km). The craft’s inclination remained at 43.5 degrees. "As with the previous missions, a nearly constant altitude is maintained by means of periodic engine firings," Molczan said. "Unlike those missions, the precision and frequency with which its ground tracks repeat are not as strongly indicative of an imaging reconnaissance mission. I find the information inconclusive, but a remote sensing expert might well see something in the data that I cannot.". Asked to comment on the current flight, X-37B officials said they would not discuss the mission as it is conducting an ongoing operation. Whatever observations OTV-3 is making in orbit, the X-37B space plane has already chalked up one programmatic milestone — that of reusability. This same vehicle was flown on the X-37B program's maiden voyage back in 2010. That OTV-1 mission lasted nearly 225 days in orbit, gliding back to Earth on autopilot over the Pacific Ocean and touching down at Vandenberg Air Force Base in California. The OTV-2 mission, which used a different X-37B craft, was launched from Cape Canaveral Air Force Station in March 2011. That craft conducted on-orbit experiments for 469 days — more than doubling its sister ship’s space stay — and also made a Vandenberg landing. There has been some talk that OTV-3 may not land at Vandenberg. The Air Force is considering bringing the craft down at the space shuttle landing strip at NASA's Kennedy Space Center, next door to Cape Canaveral. Just prior to the inaugural flight of the X-37B program in 2010, Gary Payton, then Under Secretary of the Air Force for Space Programs, underscored some of its goals. In a briefing to reporters, Payton flagged the hope for low-cost operations and maintenance (O&M) of the craft. "Once we get the bird back, see what it really takes to turn this bird around and get it ready to go fly again, to learn payload change-out on the ground, to learn how much it really costs to do this turn-around on the ground with these new technologies on the X-37 itself," Payton said. Payton said the top priority is demonstrating the vehicle itself with its autonomous flight-control systems, new generation of silica tiles and a wealth of other new technologies that are on the order of one generation beyond NASA’s now-retired space shuttle program. "Unlike the shuttle, it does not have a fuel-cell power system. It's got solar arrays plus lithium ion batteries, whereas the shuttle has hydrogen/oxygen fuel cells. So there are some differences," Payton said. Purportedly, there are only two X-37B space planes that have been built for the Air Force by Boeing Government Space Systems. But Payton told SPACE.com that it's possible the fleet could grow, depending on the success of the first two vehicles, the cost of operations and maintenance and the ease of turnaround between missions. "Admittedly, these birds don’t carry our biggest satellites…but again, they can do a very good job on our smaller satellites," Payton said. "And if they are low-cost O&M, from an O&M perspective, they could be a big part of our future." The X-37B looks a bit like a miniature space shuttle. The vehicle is 29 feet (8.8 meters) long and 15 feet (4.5 m) wide. Flights of the spacecraft are conducted under the auspices of the Air Force’s Rapid Capabilities Office, an organization that performs risk reduction, experimentation and concept-of-operations development for reusable space vehicle technologies. Mission control for OTV flights is handled by the 3rd Space Experimentation Squadron at Schriever Air Force Base in Colorado. This unit is billed as the Air Force Space Command’s premier organization for space-based demonstrations, pathfinders and experiment testing. An organizational restructuring in April of this year kept the 3rd Space Experimentation Squadron under the Air Force Space Command, but it was transferred to the 50th Operations Group at Schriever. A scan of Air Force historical records may yield clues about how OTV missions could help support some of the squadron's duties. The 3rd Space Experimentation Squadron is identified as one of two Deep Space Tracking System squadrons located throughout the world. These groups are asked to keep sensor eyes on objects orbiting high above Earth, with agencies using this information for everything from collision avoidance to intelligence-gathering purposes. The X-37B is part of a larger trend in which scientists and governments are increasingly relying on robots to explore and observe our planet, experts say. "The robotics revolution is not just limited to the atmosphere. We’re seeing unmanned systems take on more and more roles from the heights of space to the depths of the sea," said Peter Singer, director of the Center for 21st Century Security and Intelligence at The Brookings Institution in Washington, D.C.
"Indeed, there is such a long history of unmanned systems in space that it is a domain where we are growing comfortable asking questions about the need for a human’s role… basically we are okay asking, 'Why do I need a human pilot for that?’ in regards to spacecraft but not yet comfortable asking the same question about planes," Singer said. 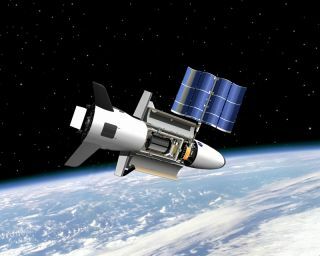 Singer told SPACE.com that the X-37B is also important strategically, "in that it gives the U.S. military more flexibility in our space operations in terms of both launch and surveillance. It fills an interesting gap between what traditional spy planes and spy satellites can do." Leonard David has been reporting on the space industry for more than five decades. He is former director of research for the National Commission on Space and is co-author of Buzz Aldrin’s new book "Mission to Mars – My Vision for Space Exploration" published by National Geographic. Follow us @Spacedotcom, Facebook or Google+. Originally published on SPACE.com.